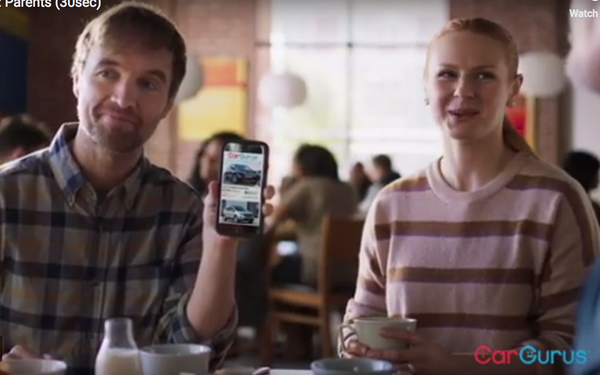 CarGurus, the online car shopping service, is adding two new commercials for 2019, continuing to follow the couple who turned to the digital marketplace in the first ad of the series. In that one, “Detective,” the husband is intently studying a wall plastered with car deals when his wife saunters in and offers to help him sort out the buying decision. Voila! She turns to CarGurus on her phone and quickly solves the dilemma. The new ads, dubbed “Detective: The Story Continues” broaden the information about CarGurus to explain specific features, like its rating system for autos — from “Great” to “Overpriced” -- and its ability to zero in on cars in specific locales. We meet the couple again in the “Parents” ad, where they tell his mom and dad about the CarGurus model they’re going to check out. A second ad, titled “Obvious,” shows the couple sipping coffee at an outdoor cafe, as a woman nearby watches cars go by and tries to sort out what she wants. The wife explains to her how CarGurus algorithms help streamline the shopping process. Sarah Welch, senior vice president of consumer marketing, says CarGurus considered a whole new approach until it saw how well the first ad worked. With the continuation, she says, the brand has turned the couple into “evangelists for CarGurus." CarGurus says aided and unaided brand awareness doubled since the first “Detective” ad. Based on Comscore data, the campaign helped CarGurus become the largest car shopping site in the U.S. as measured by unique monthly visitors. Using Google Analytics definitions, it grew its U.S. average monthly sessions 49% year-over-year in Q3 2018. CarGurus, via Ocean Media, is purchasing time across platforms from broadcast and cable to syndication and online. “We have quite a diverse base of customers, but certainly our online and mobile-first approach to car shopping has a particular appeal to millennial shoppers” — top of mind for the brand, Welch says. The two new ads are the work of the Plum14 agency, Chirp Productions and director Nick Spooner. According to the marketing firm Adtaxi, 86% of car shoppers go online to do research. The biggest percentage of them -- 32% -- start their buying experience at aggregators like CarGurus, Autotrader or Cars. com, among the many out there.